When it comes to different types of stools shapes and sizes, there is always the concern for what is normal and what is not. Pebble stools in particular raise many questions because, in addition to being a form of quite severe constipation, they can sometimes produce worrisome symptoms such as excess mucus, abdominal or back pain or even bleeding. What’s confusing is that it’s possible to have pebble stools and then normal stools or even diarrhea. Not to mention that the compacted, rough, dry consistency of lumpy stools is a source or further complications for anyone with an existing gastrointestinal disorder such as hemorrhoids. 1) Pebble stools then bowel movements that have stopped. If you’re dealing with chronic constipation and experience pebble stools during several successive bowel motions followed by bowel movements stopping, then it’s unusual. Typically, the longer you go between bowel motions, the more severe the constipation gets. And if you can’t manage your constipation by yourself by eating only plant foods, especially vegetables, dried fruits and fresh fruits as well as some nuts and seeds, drinking water and you go more than 5-7 days without a bowel movement, then it’s high time you went to the doctor for professional help. Constipation can prove to be a serious condition in some cases. For example, not having a bowel movement for 5, 7, 10 or 14 days at most can cause intestinal obstruction. Stools become so fragmented, dry, hard and compacted that they ultimately get stuck. And it can all start with one stool shaped like pebbles. 2) Pebble stools and gas. It is not at all unusual to pass gas with a bowel motion. It’s actually seen as a sign of gastrointestinal health because it means gut bacteria successfully ferment some foods. However, when you have pebble stools, this is one symptom to pay attention to. This is because, in some cases, gas with pebble stools may indicate that the constipation may not be over yet and it may help to continue drinking enough water and eating enough plant-based foods to ensure you have normal bowel movements. Gas can be almost inodoros or slightly malodorous in this case, but this typically has to do with what you’ve eaten and doesn’t usually predict the consistency of your next bowel movements. 3) Pellet like stools with mucus. Small, hard, dark lumpy stools are not kind on the lower part of your gastrointestinal tract. Their rough texture and dry consistency makes them hard to pass. In order to facilitate their passing without injuring the sensitive mucous linings, the gastrointestinal tract will produce mucus to help smooth things along. Some transparent, whitish or even yellowish mucus is usually normal. But if you experience frequent pebble or pellet-like stools with significant amounts of mucus, it might be best to see your doctor for an examination, especially if that mucus is brown, reddish or another unusual color. Also read Stool Colors: What They Mean. 4) Pebble stools with blood often indicate severe constipation, that is the stools have spent so long in that the water in them has been reabsorbed and they’ve become even more compacted, hard and dry. And when they do come out, they produce micro-tears in the sensitive mucous lining of the lower half of the gastrointestinal tract. Pebble stools can easily cause fissures or upset hemorrhoids which can result in small amounts of pink or bright red blood during or after a bowel movement. For the most part, light-colored blood indicates bleeding occurring close by, fresh, while maroon or black colors indicate older bleeding, somewhere higher in the gastrointestinal tract. But whatever the color, if you ever see pebble stools with blood or any kind of stools with blood, it is important to make an appointment with your doctor for some tests, even if just to see that you are alright. 5) Pellet like stools and colon cancer. Pellet like stools are usually considered a sign of constipation and nothing more. For the most part, pencil-thin, skinny stools are associated with obstructions in the gastrointestinal tract which are presumably caused by masses or growths. The concern is these masses may be cancerous, hence the recommendation to see your doctor if you start having pencil-thin stools. But the type of stool is not the only symptom to consider seeing a doctor for: bleeding, both bright red and dark-colored, abdominal or back pain and seemingly inexplicable, abnormal changes in bowel movement habits all require you see a doctor to find out the reason why they are occurring. 6) Pellet like stools everyday. There are actually many connotations to constipation, not just pellet like stools. Constipation refers to all forms of infrequent, hard, dry stools that are difficult to pass, whether they’re pebble like or voluminous, one-piece stools. You can be constipated and have bowel movements every day or have bowel movements only 3 times a week and not be constipated. You really have to consider both bowel movement frequency and stool consistency to determine if you are having normal bowel movements. Read more about What Are Normal Bowel Movements. What this means is that, even if you are going to the bathroom every day or almost every day, but have separate, lumpy, compacted, dry stools, then you are most likely experiencing constipation. What this symptom is telling you is that there may be something wrong in your diet, either you are not drinking enough water or are not eating enough fiber, or eating too much or the wrong kind of food. 7) Pebble stools then diarrhea. There are several reasons for why you may be experiencing pebble stools then diarrhea, either during one bowel movement or in succession. If you are constipated and cannot pass a stool for several days, a week or more, you might take action such as increase your fiber intake (example: eat dry plums), drink more water or take stool softeners. At one point, you will have a bowel movement. But because it’s been long since you’ve had a bowel movement, the old, hard, dry stool that comes first might look like pellets or pebbles. The freshly digested food can come out normal or soft, mushy-looking or even runny, liquid if you’ve eaten too much fiber or taken stool softeners. So basically, pebble stools then diarrhea can be caused by your combined efforts to treat constipation. Pebble stools and IBS. Another reason why you may experience pebble stools then diarrhea is irritable bowel syndrome, or IBS. This digestive condition can cause either periods of constipation or bout of diarrhea. For some people with IBS, constipation may alternate with diarrhea and this symptom made worse by not being on a good diet, resulting in pebble stools one bowel movement and diarrhea the next. 8) Pebble like stools that float. Do you think it’s normal to have pebble like stools that sink or float? Actually, all stool matter should gently float to the bottom of the toilet bowl. And considering that pebble stools are dense, compacted, dry stools, it would be unusual if they floated. Stools that float are also usually loose, even runny and caused by a high intake of dietary fats or infections, food intolerance or sensitivities, liver, gallbladder or pancreas problems. Other symptoms of stools that float include foul smell, nausea, bloating, gas, discoloration (yellow stools, clay-colored stools etc.) and abdominal cramps. If they persist, see a doctor as soon as possible. 9) Pebble stools, constipation and back pain. Often times, when you have pellet or pebble like bowel movements, you may also experience back pain, either sharp, acute pain occurring at the time of the actual bowel movement or a dull, lower back pain minutes before passing the stool or continuing afterwards. Lower back pain at the time of a bowel movement can be caused directly by the constipation. Pebble stools being hard, dry and compacted, they are difficult to pass and require pushing which may result in lower back pain. If this is the case, pain should subside minutes after the bowel movement. A similar abdominal pain is also possible. If there is no heating in the bathroom and you felt cold, especially on the lower back, then experiencing back pain some time after a bowel motion can originate in the muscles. Often times, it can be mistaken for kidney pain. Also read Kidney Pain or Back Pain. Sharp back pain when expelling pebble stools can be caused by pre-existing conditions of the spine, including pressed nerves, sciatica or herniated disc. Tailbone pain with bowel movements can be a result of a tailbone fracture, infected cyst, vertebrae compression resulting in fractures or various infections in the area. A continual, dull, prolonged back or stomach pain after bowel movements, especially if it’s associated with bleeding or pencil-thin stools, is a reason for concern and indicates it’s time to make an appointment with your doctor. Conclusion. 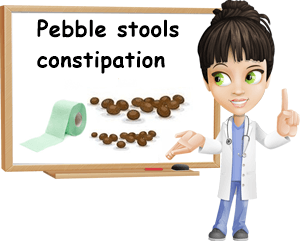 There is no reason to think that you have pebble stools but no constipation. Pebble stools are the definition of constipation. And while not worrisome on their own if they occur infrequently, it is important to be on the lookout for certain unusual symptoms that may be telling you it’s time to see a doctor. Too much mucus, abnormal colors of mucus, bleeding, pebble stools then diarrhea, pebble stools and back pain or simply having pellet-like stools every day are signs it may be time to seek medical help. Avocado: How Many to Eat per Week? Bruh, this hurts. I don’t even know what I have. Some are floating and some are on the bottom. There’s blood but idk bc I’m on my period omg. It can be like that too: you can have some pellet or pebble like stools that float AND some that sink to the bottom of the toilet bowl. Sometimes it’s just because some pieces are just too light (it happens! ), while others too compacted, too heavy. How long have you been having pebble stools for and how frequently? Are all the pieces hard, dry, compacted and dark brown? Or are some softer, mushier with ragged edges (and possibly even lighter in color, like a light yellow brown, maybe?). Was there blood visible before the period too? (It’s important to determine where the blood comes from). And what about your diet, do you eat enough vegetables, fruits, whole grain cereals, nuts and seeds and drink enough water?